This row of generous 8-9mm oval pearls is interspersed with smaller round pearls for visual interest, and is fastened with a sterling silver rose clasp. Available in a choice of lengths. Your necklace will be dispatched to you in a high quality velvet pouch, suitable for gifting. Pearl Station Necklace 9ct Gold Cultured Kasumi Pearls - 31"
A fabulous, show-stopping matinee length station necklace featuring nine gorgeous Kasumi pearls, with their naturally rippled surface and rich lustre. 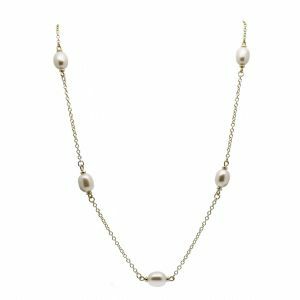 Similar in design to the necklace most often worn by Mary Berry, and a much sought-after gift, this beautiful necklace features high quality oval cultured freshwater pearls. Perfect for a special occasion. These fashionable Tin Cup Pearl Necklaces have high quality oval pearls, and are mounted on a 18'' long sterling silver chain, with a sterling silver lobster clasp. Available in White, Pink, Lavender and Black.